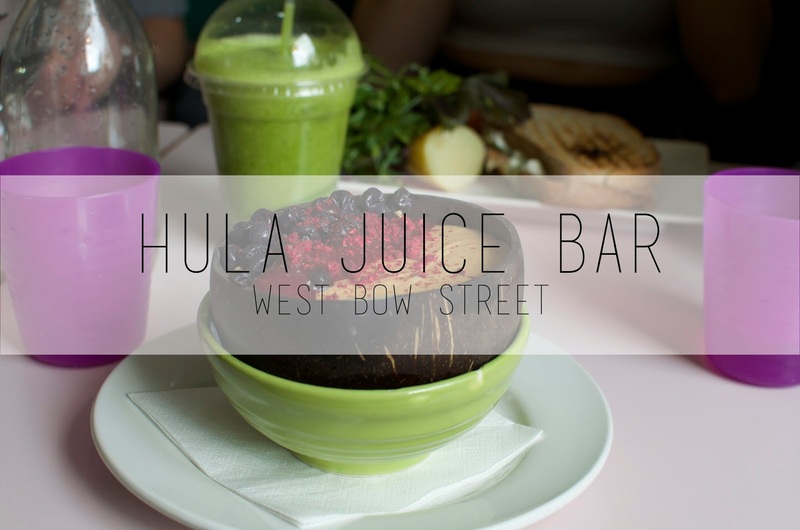 Hula Juice Bar is one of my favourite places to go for a treat without feeling like I've cheated on my diet (although let's be honest, I'm always cheating on my diet). Hula values a strong avocado to toast ratio (illustrated wonderfully by the below picture) and that's the kind of place I feel strongly about promoting. It is conveniently located at the end of West Bow street so just before Grassmarket. Hula Juice Bar has a great range of food that won't make you feel guilty because it's all super healthy. They've had a bit of a makeover since my last visit and have a fun and bright décor. I especially love the little coconuts on the table that hold the cutlery. Their menu has tons of choice – maybe too much choice as I always have difficulty deciding if I want something sweet or savoury. They have a separate breakfast and lunch menu, though there is a lot of overlap between the two, and tons of amazing drink choices from alternative coffees like a turmeric latte to green juices and smoothies. On my most recent visit I went for the Maca Nana Bowl and I'm now in love (and have been rather unsuccessfully been attempting to recreate it at home). It's a maca banana smoothie bowl topped with all my favourite things including granola, blueberries, raspberry powder and the best peanut butter I've ever tasted. I wish I had asked them what peanut butter they use or if they make it (and if they do where can I purchase it in bulk). One of my friends went for the avocado on toast which was also available in gluten-free which was ideal for her as she can't have gluten. There's plenty of options for vegetarians and vegans as well – even the matcha lattes use almond milk. From loaded sourdoughs and open sandwiches to rainbow bowls, Hula is the definition of guilt-free indulgence. Unfortunately I do have to warn you that the service can be a bit of a miss. Hula is quite a small place but it does have a big following and it is in a prime location so it is pretty much always busy. The last time I was there it didn't seem overwhelmingly busy but we could tell they were a bit short staffed. We waited quite a while on our food, to the point where we wondered if we had been forgotten about. Plus we kept getting brought food that was not ours – which to a bunch of hangry girls is quite the tease (because it all looked so good)! It didn't even just happen to us, one waitress brought some plates of food to the table next to ours and they had already finished their food! When our food finally came, my friend's order was wrong and our two matcha almond lattes had been forgotten. They were apologetic about it and took them off the bill, but overall I was left quite disappointed by the service. I've been to Hula before and not had any of these problems before so maybe we just got unlucky this time. I'm totally willing to give Hula many more chances – the food is definitely worth the wait (and luckily my food didn't go cold waiting on my latte... because it was already cold). Overall though Hula is one of my top recommendations for breakfast, brunch or lunch. The food is tasty and flavoursome and best of all healthy. The avocados are fresh and the peanut butter is dreamy – what more could you want really?